Macy, Mooch (standing), and Mocha soon after I adopted them in 2002. I am now without my sweet baby Macy. I took her in to a local veterinarian to have her euthanized on Tuesday (October 11). Macy lived a lot longer than any of my previous ratties. The lifespans of Homey, Pudge, and Smudge (primarily my mom’s rat) averaged less than two years. The three sisters Macy, Mooch, and Mocha were born more than three years ago, on July 29, 2002 (or so I was told when I adopted them on September 7 of that year). They seemed to be the most docile of the litter I saw at the Rat Adoption Fair being held in a Sunnyvale CA pet store. Apparently they were all the products of a late-night fling when one of a breeder’s male rats mistakenly ended up in the cage with all the lady rats. When I introduced “my girls” to their new home, Macy turned out to be very easily spooked, and Mooch became the hyperactive hellraiser who was constantly trying to explore. Mocha was the sweetest. Unfortunately she died very young when she climbed up inside my recliner chair, and I believe suffered a broken neck. As distraught as I was over Mocha’s death, I was thankful that Macy and Mooch would still have each other. 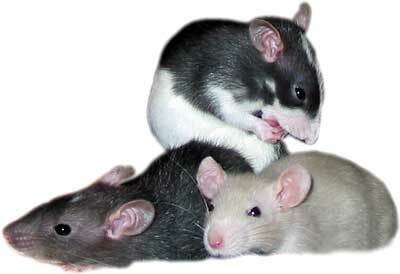 Rats are such social animals, and I adopted the sisters with the intent that they would always have company. In my ideal world, all three would have passed away around the same time. As things turned out, both Macy and Mooch mellowed out a bit. About a third of my living room was penned off for them, and whenever I was home I’d let them run free in their sizable play area. For moments at a time, they’d stay still long enough for me to hold them on my lap or under my sweater. Then, one evening in late December 2003, I found Mooch very ill in their cage. She was hardly moving, and her eyes were drooping. I took her to a 24-hour emergency vet, who suspected that her intestine had “telescoped” in on itself. Prospects for a successful treatment and recovery were slim, and the diagnosis was confirmed the next day by my regular vet. She wasn’t even a year and a half old, yet I felt no choice but to have Mooch euthanized. It was my 30th birthday. My great plan to never raise a solo rat again had fallen short. Based on the lifespans of my previous ratties, I expected that Macy had another half-year or so in her. I knew that finding a good partner for an adult rat is extremely difficult, so I decided to just give Macy as much of my time as I could afford. As Macy got older, she became a great little companion pet. We got into a comfortable routine of feeding, playtime, and “lap time.” I didn’t get any sense that she was excessively lonely. She didn’t wait anxiously at the cage door, chewing at the wire mesh, like my previous lone ratties used to do. When I did give her attention though, she appreciated it. As I started considering a teaching career in early 2004, I had the perfect timeline planned out. Attempting to enter a classroom for the 2004-05 school year would require a frantic dash, so instead I would aim for the 2005-06 school year and use the meantime for “research.” In a little over a year’s time I would launch my new career and take the opportunity to relocate to another part of the country. By that time, Macy would surely have passed away, right? My plans began to fall into place in early 2005. I applied to the TGNO (Teach Greater New Orleans) program and got accepted shortly thereafter. I bought an investment condo, moved out of my current condo, and rented them both out with precise timing. My move to southern Louisiana was quickly approaching. Not according to plan though, Macy was still alive and kicking strong! Don’t get me wrong – I was glad she was in such good health, but it threw a wrench in my plans. Leaving her behind in California wasn’t an option, and it took quite some effort to bring her along with me to the Greater New Orleans area (as documented in earlier writings). Macy was a beautiful little piece of my old life that I brought along while starting my new life in Louisiana. I wanted to ignore the fact that she was getting old. I knew I ought to develop a list of local veterinarians who could treat rats, but kept finding reasons to believe Macy would conveniently hang on long enough for me to get settled. However, the whole summer has been full of reminders that life doesn’t always go according to plans. Four months have shown me the bankruptcy of a school system, a reneged promise of guaranteed employment, a burglary, a catastrophic hurricane and its aftermath, the departures of many new friends, and a teaching position that could be taken away from me any day. I kept Macy by my side through it all, and she continued to bring a little feeling of home as I moved numerous times, including the evacuations to Baton Rouge and Texas. Now I’m finally back in my Kenner apartment, but nothing feels secure out here. In recent weeks I’ve been learning to adapt, and view everything as temporary. And finally, I forced myself to acknowledge that Macy’s final days were drawing near. Macy peeking from one of her favorite hangout spots in early 2005. I got home Tuesday evening from Bonnabel. Several kids who had been added to my classes this week were making life difficult, and I needed a brief rest before I could prepare for the next day. I lay in bed, and held Macy on my stomach as I so often did. I felt the scabs that had developed on her back earlier this year (Were they the result of mites, lice, a pituitary gland imbalance, or thinning skin? No one could tell me for sure). Had she lost even more hair in recent weeks? I felt her ribs and wondered how much weight she had lost since she was in her pudgy prime. I noticed her whiskers had become thin and curled, and lost the constant twitch that’s common to healthy rats. I watched Macy crawl up my chest, somewhat dragging her back feet. She seemed tired. I noticed that she had recently been stumbling while climbing up and down between the three floors of her cage. Her hygiene had gotten poor, and when she did stand up to groom herself, she had trouble keeping her balance. Then, while I lay there, all of a sudden Macy insisted on crawling up toward my face. I held her back as she tried to pull down on my lip, but she persisted. She’s occasionally done this before, but for some reason I got a strange feeling this time, as if she was trying to send me a message. I’m trying not to read too much into her behavior that day, but any longtime pet owner can verify that people really learn to read their pets over the years. I felt a little like she was telling me goodbye. 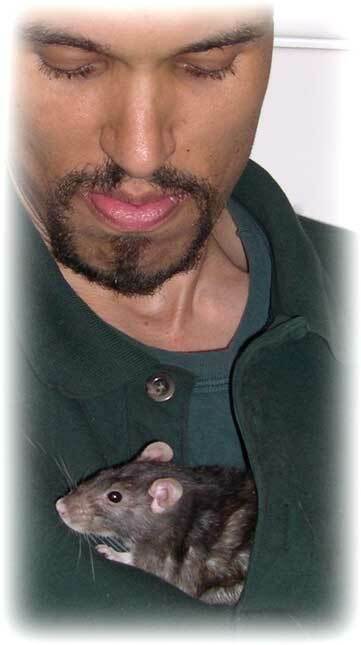 I’ve often wondered whether I let my previous ratties linger on too long before having them euthanized. I honestly don’t think Macy was suffering yet. Even those scabs on her back seemed to be suspended in some intermediate stage of healing. They never bled, yet they never went away either. Nonetheless, the other signs of her decline made me feel that suffering was imminent. I didn’t want to later question whether I had waited too long. I also didn’t want to leave my apartment every day, wondering whether I’d find her alive when I got home. I went downstairs and looked up several nearby veterinarians. It was about 4:40pm, and the second one I called was about to close at 5. They assured me that they’d stay open until I came. I didn’t let myself think too much about all “the lasts”: the last time I’d come home to see Macy, the last time she’d leave my apartment, the last time I’d travel in the car with her. We arrived at the vet’s office and I quickly took care of the paperwork. I carried her back to the patient rooms bundled up in one of my shirts. The doctor gave her a sedative to essentially knock her out. Macy screeched in pain from the shot, and I comforted her the best I could. As she became more lethargic, I scratched the back of her neck and kissed her belly (for the last times). Once Macy was unconscious, the doctor gave her another shot that stopped her heart. She was now dead. I had no place to bury her, so I opted to have the vet’s office send her body away for cremation. I looked at Macy’s lifeless body and could no longer ignore that this was the last time I would see her. It had been a long time since I’d cried. The last time was when Mooch died almost two years ago. This time, I wept for the sweet little companion who had kept me company through the most unsettling time of my life. Macy definitely complicated my plans to start a new career and life in another part of the country. Looking back though, I’m sure glad she stuck around as long as she did. What a sweet little rat she was.